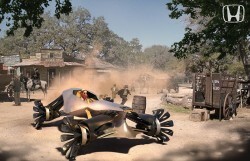 The theme of this year's LA Design Challenge is "Hollywood's Hottest New Movie Car". We're big fans of the annual LA Design Challenge that runs alongside the LA Auto Show. It always throws up some bizarre concepts and ideas. 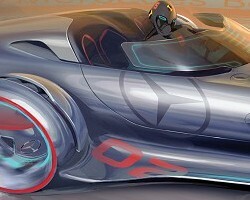 This year's theme is "Hollywood's Hottest New Movie Car" so the designers had to envisage a whole storyline to go with their bonkers creations. Only six design houses entered the competition, but they've more than made up for the lack of entries. Below is the overview, while the image galleries and articles are linked to on the left. Enjoy. Honda's film takes us hundreds of years into the future, where mankind is struggling to survive following an impact with a massive comet. The IH car is designed to be a trusty companion in the same way horses were in the Wild West. Although technology was supposedly wiped out by the comet this Honda is loaded to the hilt with sci-fi stuff. The film climax seems to be a 'High Noon' showdown between several examples of the IH competing for fuel and other resources. Just a little bit freaky for us. 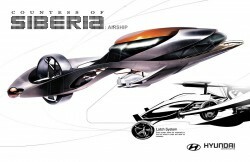 Hyundai Design North America dreamed up a vampire action thriller called 'Countess of Siberia'. The human star has to travel the world fighting communism, but must not be seen for some reason. Hence her Hyundais have a 'magical stealth force', making them invisible during the day. 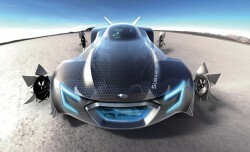 Her daily ride is the Stratus Sprinter, which is a crossover of the future as far as we can work out. Why she needs the space of an MPV for her solo trips isn't explained, but we do like the sounds of the DB Atlant, a seriously futuristic interpretation of one of those camper vans that houses cars in its belly. Who gives a toss about the, frankly awful, storyline in Merc's film, 'Silver Lightning'? It features crash test dummies saving the world or something. Instead, take time to browse through the gallery of pics and then print a few out, bring them along to your Mercedes-Benz dealer and say "like that please". Awesome. 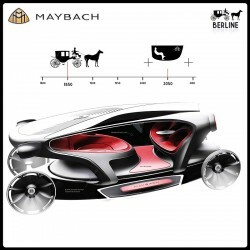 The existence of Maybach itself could be believed to be a work of fiction, but this could be its designers' best work yet. They've taken the Mercedes-Benz GL as a basis and made it look like an ancient horse-drawn carriage. It draws inspiration from the historic Berline Carriage and it does look remarkably elegant. The film itself seems to be a take on Cinderella and the Berline is piloted automatically from something called the 'Maybach Virtual Chauffeur Center'. Now there's an idea. 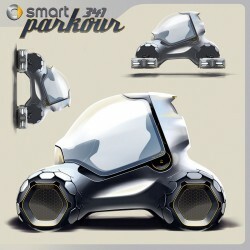 Parkour is an urban 'sport' on the increase and this funky Smart of the future lives up to the name with a range of abilities that include hovering and sticking itself to walls at odd angles. That's all in the name of finding a parking space in the overcrowded cities of the future, but our human star of the Smart film, dubiously titled 'Annie get the Grannies! ', uses the car's talents to hang out for that career-changing photograph. It could be that the paparazzi are bored of WAGs and are moving to the grannies instead. Or have we just not read the full release?